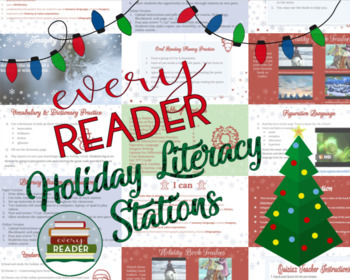 Christmas Literacy Stations, Activities, Handouts, Interactive QUIZZIZ, & More! This product contains everything you need to successfully set up and facilitate seven literacy stations in your classroom! 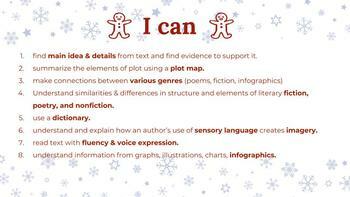 These Christmas holiday activities are engaging, self paced, differentiated for various levels of learners, and provide student choice and voice. 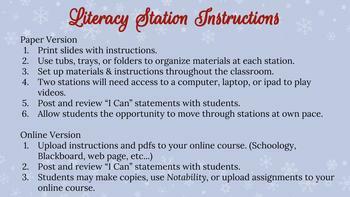 Holiday station activities could be used as a formative assessment of skills. I have used these successfully in my classroom, and received an excellent formal evaluation from my administrator. You will receive one task card and activity for each station, handout, graphic organizer, suggestions for differentiation, video book trailers, "I Can" statements, and an interactive QUIZIZZ learning link. • I value your feedback, and it earns you credit! Please go to your My Purchases page (you may need to login). Beside each purchase you'll see a Provide Feedback button. Click on it give a quick rating and leave a short comment for the product. Each time you give feedback, TPT gives you feedback credits that you use to lower the cost of your future purchases.